In a pan bring the milk to a boil. Then keep it on heat for it to get condensed, till the milk reduces to ¾ lt.
Add 6 tbsp of sugar and the salt and stir so that the sugar dissolves into the milk. Leave the milk aside for it to cool. Beat the eggs and mix it with the milk after it cools. 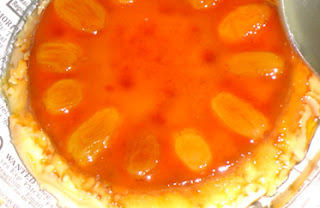 Once cooked, let the caramel custard cool. Then run a knife around the edge of the bowl so that the custard no longer sticks to the bowl. Now place the serving plate upside on the bowl and then turn the plate and the bowl over. The custard would come out of the bowl easily this way, with it’s decoration intact. Now you may refrigerate and serve the custard cold or otherwise serve it as it is. *The sugar quantity may be reduced or increased according to one’s taste. ** If you do not want to decorate, you may skip this step. Or, you may caramelize it without the resins.